As plastering has now finished, we can now get a feel for how effective the solar gains will be. On a cold sunny day we are finding that the temperature inside is at a very comfortable 15 degrees and at times I witness workers inside in t shirts and workers outside in heavy winter jackets – a true litmus test! The energy balance denoted below taken from our PHPP denotes how the small energy losses are offset against the gains. In this case, the annual energy from the sun captured by the windows represents 17.7kWh/m2/a, almost 3kWh more than the work that is expected from the heating system. The next stage is the certification process and we hope to have this complete by Feb 2015. 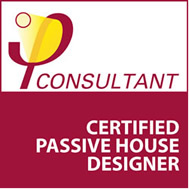 This is done in conjunction with the Passive House Academy in Wicklow and the Passive House Institute in Germany. It should be noted here that this is not a mandatory part of the PH process but we feel it is a necessary step to show people that this type of construction is available and is superior to how we build our homes. Should a tour of this Passive House be of interest to you please do not hesitate to contact us.